The nation of Japan is a world on the verge of peace, having recently been united under Hideyoshi Toyotomi. 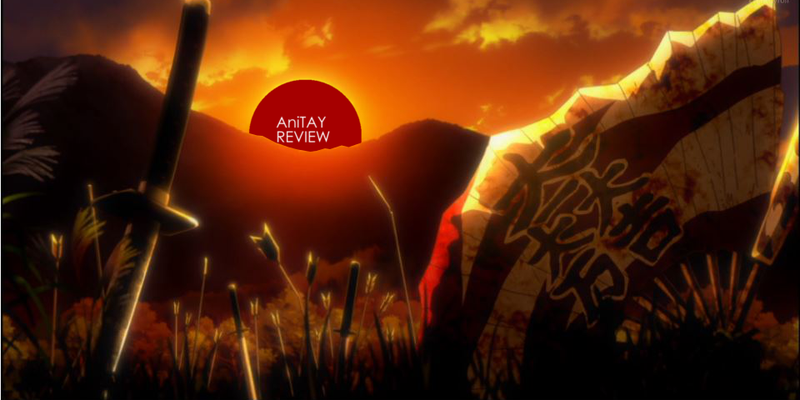 However the death of the great leader causes a rift between the feudal lords of Japan, and once again Japan is caught in a fierce power struggle as the final days of the Warring States Era play out. This is the stage set by Samurai Warriors, a winter 2015 anime by Tezuka Productions based on the game Samurai Warriors 4- II by Koei Tecmo. But is this series truly worthy of the title Samurai, or is this a series to be thrown aside like so many generic katana fodder? As a starting note, I would like to clarify that I, the reviewer, am not well acquainted with the Warriors franchise, with the only one I've played being last years Zelda spinoff Hyrule Warriors. Neither am I an historian, and have very little knowledge of the actual historical events of which the games, and this anime series, are based. As such my review is that of a novice to these things. This series begins and ends excellently, with Episodes 1 and 12 being the most spectacular and exciting episodes of the entire series. (And when I say episode 1 I mean episode 1, not the hour long Prequel OVA which I refer to as Episode 0) These two episodes have the best choreographed fight scenes and have a sense of momentum and speed that were exhilarating to watch. The background music to this series was a great addition to the series. It was appropriately epic, and elevated many scenes' emotional resonance, and excitement. I was surprised indeed how emotional I got with this series in the final episodes, and the music was a great part of that resonance. All of the major characters of the show, the titular Warriors, have very elaborate and striking designs. And while they at times felt overly produced, especially when compared to the common soldiers, each of the many designs were distinct and bold and looked striking on the screen. I was genuinely surprised that the animators were able to keep such busily designed characters on screen without noticeable drops in detail. The conflict of this show was a fascinating conflict, with ended up being an ideological battle where both sides hoping for eventual peace. This is not a show with many clear good guys and bad guys, and i think the show did a good job keeping the conflict in a morally grey area where both sides could be considered noble and justified. This show understands the importance of character and backstory to a narrative, allowing for a great deal of investment in the major players of this conflict, especially in terms of the Sanada brothers, Yukimura and Nobuyuki, who are the main focus of this series. However this series often seems to favor the backstory a bit too much, and be slightly heavy handed to the point where it was fairly predictable. This show has a little bit of a pacing issue, in that after the first couple episodes the series gets increasingly political and conversational, leading to a feeling of slogging through details. Many of the conversations seemed to go on about twice as long as was strictly necessary, and the show overall had a surprising lack of battles, which was odd for a show based off of a Warriors video game. This anime seemed to want to give a lot of buildup and detail into the setup to the battles, and take forever to actually get to the fights. It also didn't help that much of the show was driven by narrative voiceover, which is not the most engaging method of getting through the story. 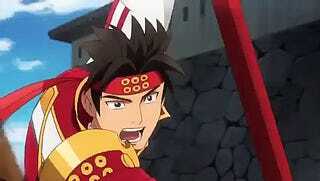 Sadly, for a show where I came in expecting some epic battles, I came away from Samurai Warriors disappointed. Part of this I put down due to my first "Fantastic" point, in that the first episode had such a fluid and impressive battle that the rest of the series' action scenes (exempting the finale) just didn't live up. A lot of the battles in the middle of the season had a greater percentage of shots be still frames, backgroundless moves and narrated maps that made those battles just feel cheap by comparison. Samurai Warriors starts off badly, by introducing far too many characters all at once in the beginning of the series. While this may not bad in and of itself, being unable to always keep names and faces straight hurts a lot, especially when important plot points are narrated without helpful visual aid. As someone unfamiliar with the source material it took me quite a while before I felt comfortable with having such a large supporting cast. So this guy here, who's name is Kotarō Fūma, shows up in a couple episodes in the middle of the series, and I frankly did not get the point of this guy. Apparently he is a ninja according to the game wiki, however he felt to me more demonic and supernatural than ninja-esque. The issue I found was a tonal one, as the rest of the show felt like a Docu-Drama rather than a fantasy take on history. Thus Fūma here was the only one who seemed to have supernatural powers of any kind (besides that of being very strong like the rest of the warriors) which included making shadow copies of himself. He was the one character that didn't seemed to fit, but after his one fight he disappears from the story, which causes me to wonder why he had to be there in the first place. Samurai warriors was not a terrible show, but neither was it particularly engaging throughout its run. It had a couple of highlights however I found the middle to be a slow drag through a lot of political talk, when what I wanted was a bit more action. It may be a fun show as an aside, but it is not a must watch, though if you do start, I will advise that you stick to the end, for at least it finishes well. Samurai Warriors was a 2015 winter Anime anime by Tezuka Productions, It is available for legal streaming in North America via Crunchyroll and Funimation Entertainment.